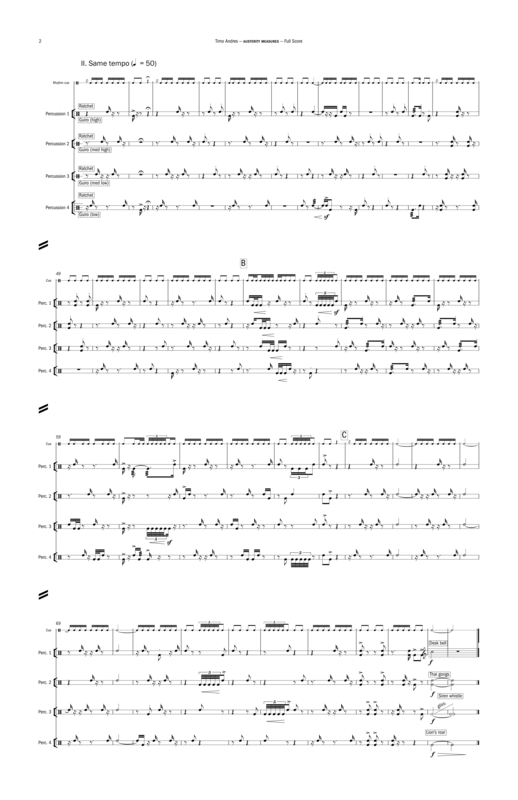 My music tends to spring from harmonic ideas, but in writing a large-scale piece for percus­sion quartet, I realized that the idea of harmony itself was only one of several paths I could take. The quality of percus­sion is often more “sound” than “note,” and when you get rid of notes, of course, you lose harmony. How, then, to present a coherent 25 minutes of music, freed from my faithful anchor? I started Auster­ity Measures by trying to be as orga­nized as possible. Writing for percus­sion is more wide-open than almost any other medium (save for elec­tron­ics, perhaps), and involves concep­tu­al­iz­ing an original setup consist­ing of any combi­na­tion of the thou­sands of instru­ments that exist. Multi­plied by four, things can get unwieldy quickly. The four setups in Auster­ity Measures, there­fore, are them­selves arranged roughly like a string quartet: two highs, a medium, and a low. Contained in each of these setups are various sub-setups, spanning raw, unpitched non-instru­ments to the pure, tempered keyboards of glock­en­spiel and marimba. These are ordered and grouped in terms of material and timbre, too—metals, woods, drums, clean sounds, dirty sounds, all in grada­tions from high to low. 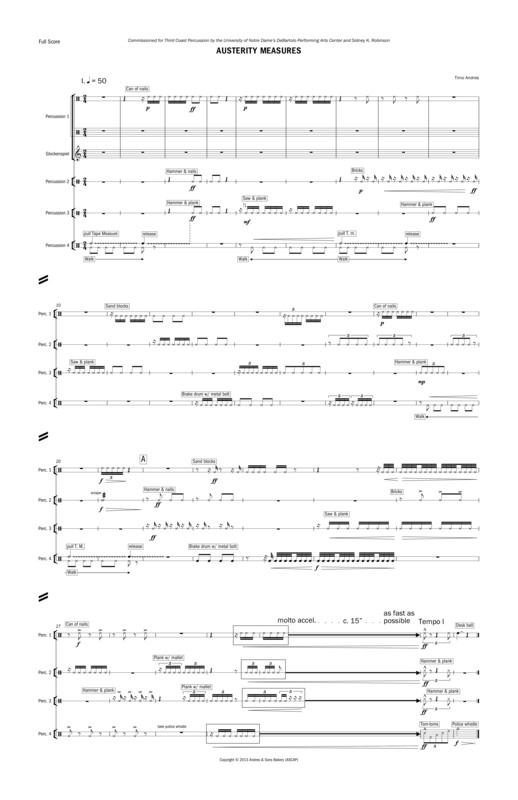 The actual music of Auster­ity Measures is quite rigidly orga­nized: it’s a theme and set of vari­a­tions, a struc­ture which lends itself to tidiness. 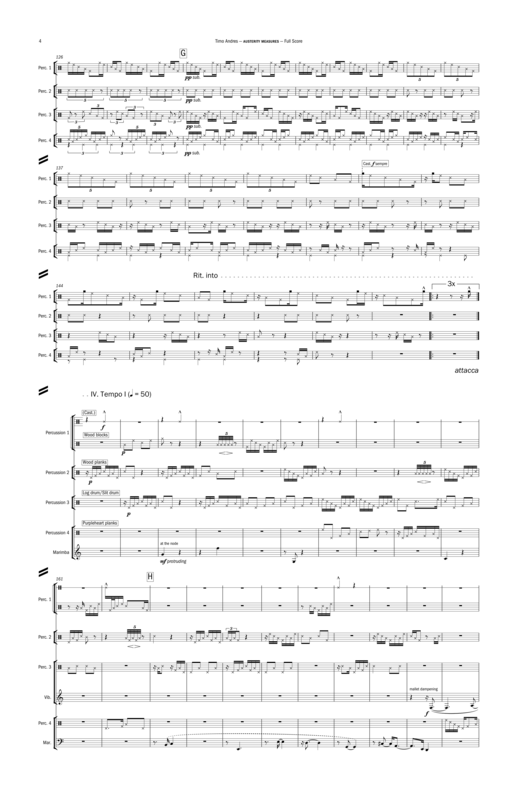 Unchar­ac­ter­is­ti­cally, the theme is at the end, a goal which the music strives towards; there­fore the begin­ning of the piece actually sounds least like it. The theme itself is a familiar one: the first of Bach’s Two-Part Inven­tions, in C major. I chose to use a piece of familiar, preex­ist­ing music so that the overall struc­ture would be convinc­ing; I needed to be able to grad­u­ally reveal the theme in a way that would be audible at first hearing. 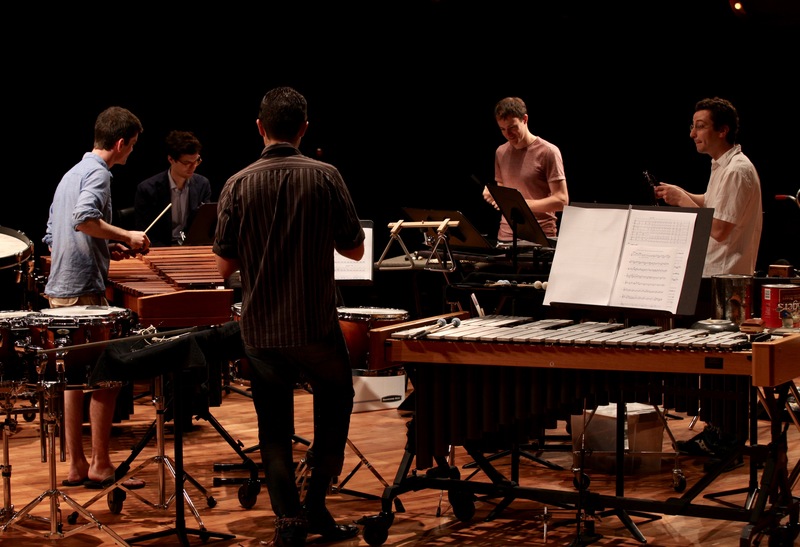 Percus­sion­ists, espe­cially as students, often play Bach on the marimba. Auster­ity Measures makes the process of learning Bach explicit—it’s almost as if the instru­ments them­selves are figuring out how to do it. Again, this process is method­i­cal. The first sounds heard in the piece are raw and unfin­ished: construc­tion tools and other found-objects hijacked for rhythmic purpose. These rhythms are heard in subse­quent vari­a­tions on progres­sively more “finished”-sounding instru­ments: grinding ratchets and guiros, wooden planks and blocks, wailing sirens and flex­a­tones even­tu­ally coalesce, first around single, stranded pitches, and finally around complete harmonies. By the time any actual Bach is heard, we realize we’ve been hearing it all along, just with the pitches removed. 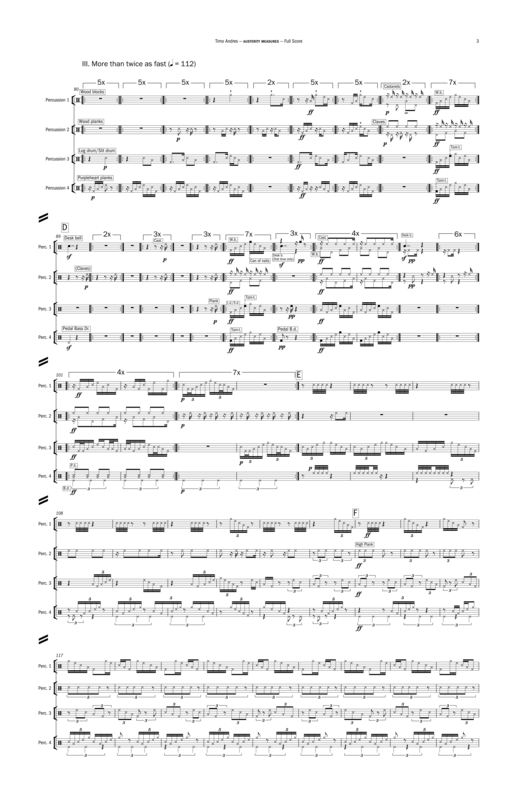 Just as the first half of the piece focuses on Bach’s rhythms, the second half focuses on melodic and harmonic aspects, often veering off-course into my own material, and even working in bits of other Bach pieces. By the end, the music “realizes” it can do every­thing at once, and it very quickly rewinds back to the begin­ning. The end result is not about evolu­tion or progress so much as it is about protean adapt­abil­ity, perhaps the defining char­ac­ter­is­tic of percus­sion and percus­sion­ists. Work­shop­ping “Auster­ity Measures” with Third Coast Percus­sion at Notre Dame. 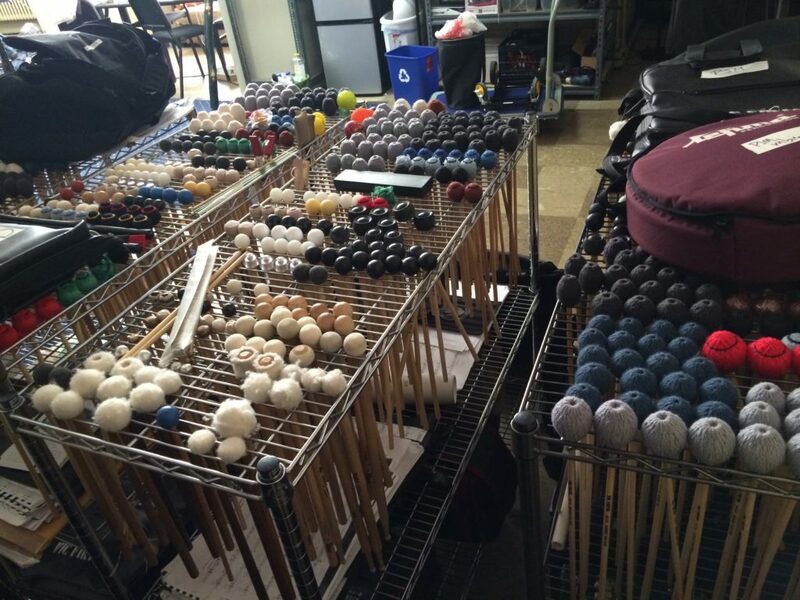 impor­tant mallets at the Third Coast Percus­sion studio.